In late December, I went on a cookbook binge. I was not feeling inspired in the kitchen, and my cooking needs had changed from "meals that can be done in thirty minutes" and might involve 28 minutes of standing at a hot stove to "meals that can be thrown together in 5 minutes and then put in the oven for an hour while you answer your email." 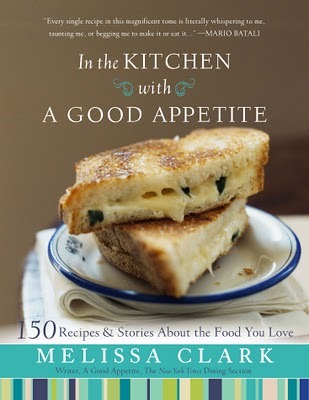 One of my great finds was Melissa Clark's In the Kitchen with a Good Appetite. ($27.50) I've made up many of the dishes from this book (and you'll be seeing more recipes from it on the blog), but one that immediately stood out as a "cook me NOW!" selection was this one for chicken parts roasted in the oven on a bed of country bread with garlic, thyme, and mustard. These are some of my all-time favorite flavors, and the prospect of having bread made crispy with mustard and chicken drippings was too good to pass up. As soon as I read the recipe, I knew that Merlot would be perfect with the dish. So I bought the ingredients, flung them into a heavy roasting pan, turned on the oven, and searched through the wine closet for a Merlot. The bottle that I found was a 2007 Chateau Souverain Merlot Alexander Valley (suggested retail $17; available for $12-$19). This excellent QPR wine will make you remember what is great and good about Merlot. It's one of the best examples of the grape that I've had recently, with luscious blueberry, huckleberry, and plum aromas and flavors. There are hints of ground coffee in the midpalate and the aftertaste has a distinctive note of cedar. Those rich, fruit elements, the dark coffee notes, and the cedary spice all went beautifully with the robust chicken and its mellow mustard and garlic flavors. It was the perfect, comforting pairing for a cold winter's night. Full Disclosure: I purchased the cookbook, but received a sample of the wine for review. I got the cookbook for Christmas and just recently read through it, wondering which recipe to try first. That chicken recipe sounds delicious and I will definitely try it--maybe with a merlot! Thanks for your great wine and food posts. I look forward to reading them. Another great post about good food and fine wine. I enjoy reading your posts, as usual;) You give me great cooking and drinking ideas! What's an "excellent QPR wine"? Did you choose the recipe and then pick the wine, or vice versa? Sounds yummy! I just did the same thing and bought four new cookbooks and my tastebuds are going crazy waiting to try all my new finds. Thanks for the merlot suggestion, it is hard to find a good one these days even though I know they are out there! Thanks for the post I always enjoy your suggestions and your wine prices! We recently had this Merlot as well and were truly blown away with the quality at this price. I am a wine merchant and this is a Merlot that I freely recommend to people knowing that it will be enjoyable for them. great find!